The Rotary club of Braintree is celebrated it's 94th anniversary in the year 2017. We are very proud of all the members, the founding fathers and all those devoted people who over these 94 years have risen to uphold the Rotary motto,"Service Above Self". It is our mission to provide service to our community and to support humanitarian projects elsewhere in the world. Our club currently has about 60 members, each giving of their time for achieving Rotary ideals to make this world a better place. What better way to spend a Friday afternoon....golfing in Braintree! Foursomes are filling up fast, so act now. The registration fee includes a boxed lunch AND dinner. Check out the Registration form (link on the right column of the website homepage) for the various sponsor levels. Always looking for raffle prizes and items for the golfers goodie bags (at least 144 needed). Click on the "contact us" email if you have anything that you would like picked up. Thank you for helping us to support the various needs in our community. 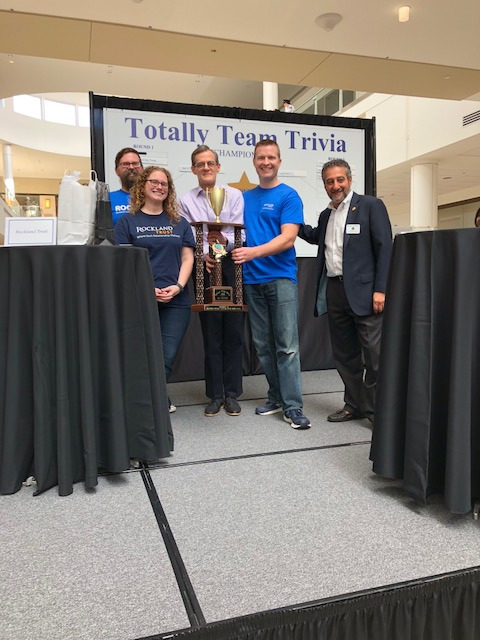 Team Rockland Trust was the proud winner of this year's Totally Team Trivia event! This annual fundraiser was held on Saturday, October 13th at the South Shore Plaza. 18 teams competed for the coveted Trivia Trophy, bragging rights for a year AND a $200 gift card. Special thanks to all of our generous sponsors whose contributions allow us to continue serving our community through our various projects and outreach.